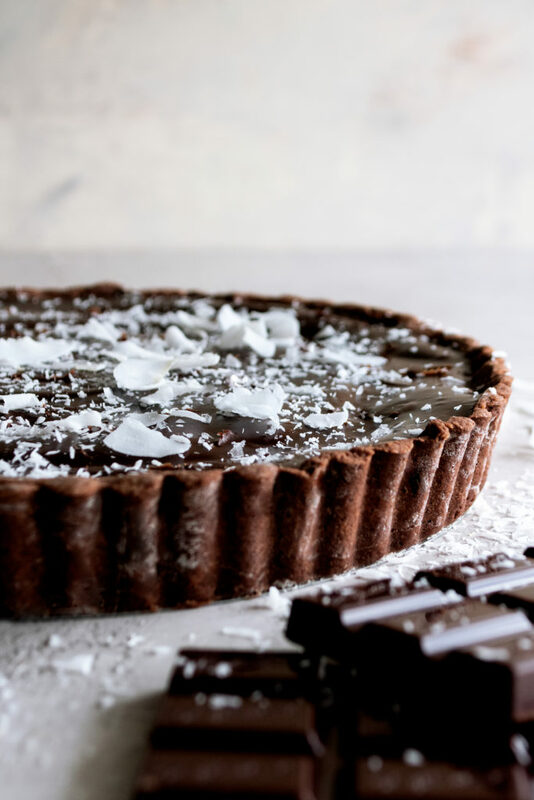 An irresistible salted chocolate coconut tart that is going to be perfect for all the upcoming spring celebrations! It’s a recipe that can be made in advance and just pulled out of the fridge before the big event. It’s sweet, decadent, and oh so chocolatey. 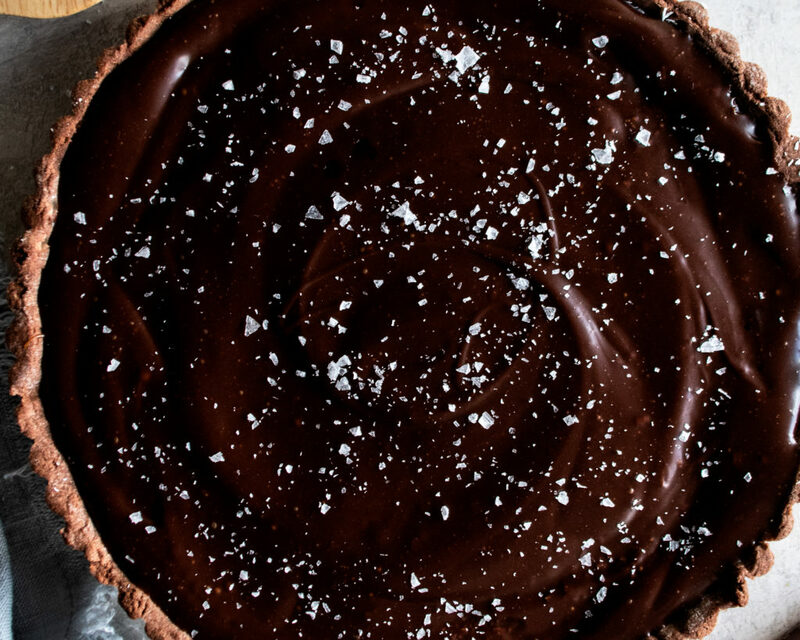 I’ve been wanting to make a chocolate tart for awhile now. I’ve tested a few versions in the past, but was never quite content. 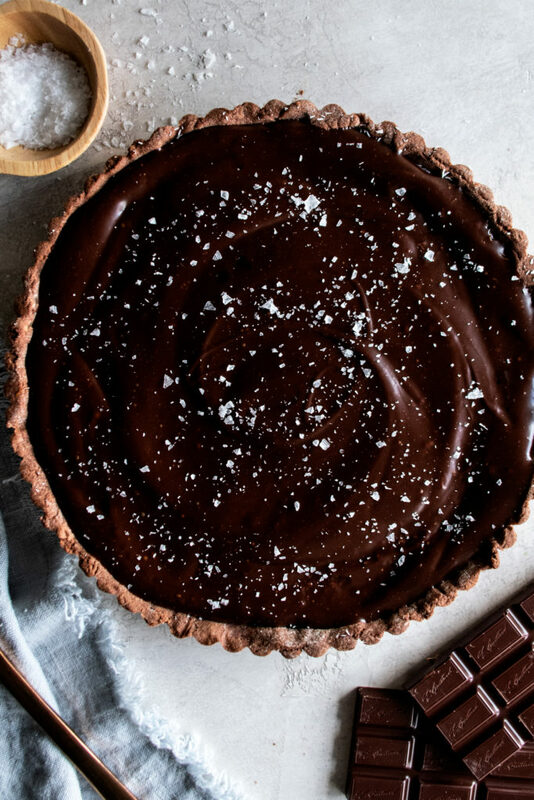 Spring seemed like the perfect time to revisit the idea, because I always think you need a really good chocolate dessert in your back pocket this time of year. 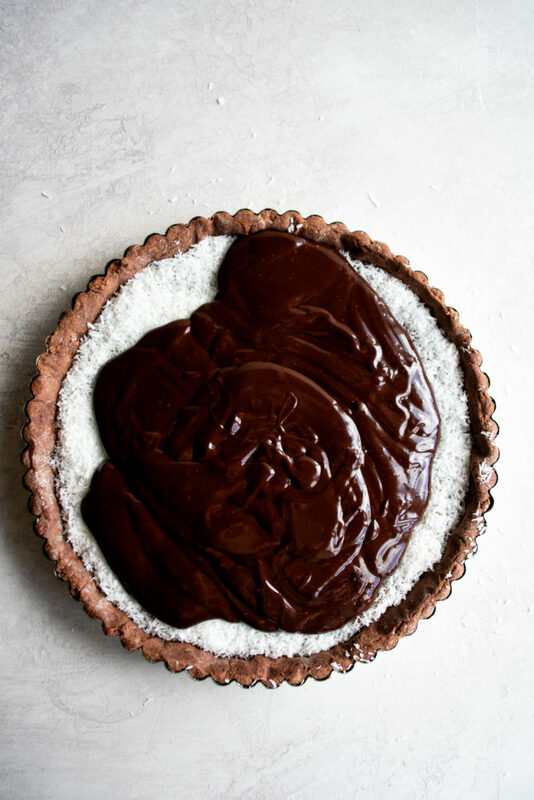 This salted chocolate coconut tart has a chocolate cookie crust, a layer of sticky caramel, a layer of sweet candied coconut (kind of reminds me of the filling of an almond joy which I LOVE), a layer of rich chocolate ganache, and of course some flaky sea salt on top. When writing this recipe out, I realized it comes across as a difficult tart to execute. But trust me, it really isn’t! 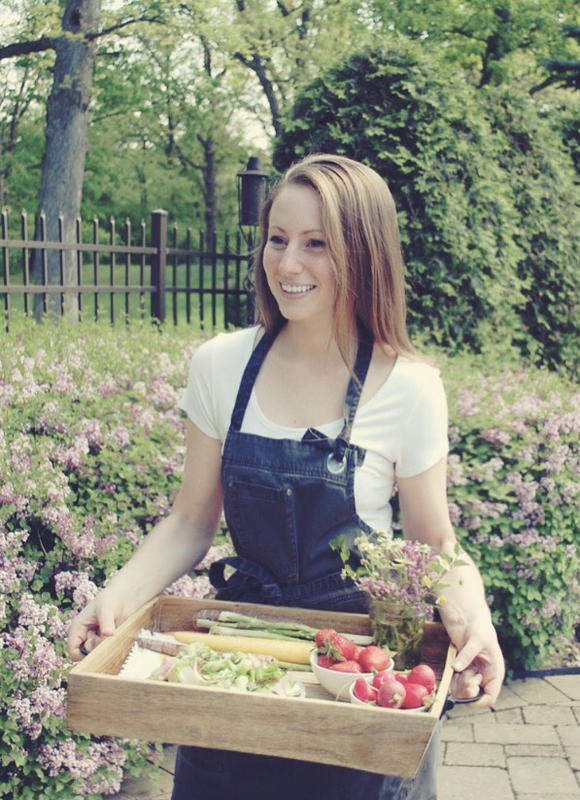 Yes, there are a lot of different steps… but, once you break it down and take it layer by layer, it’s very manageable. My advice? At least make the crust in advance. The dough takes an hour to chill, then you have to roll it out and bake it, then cool it. It’s a simple process, but feels so good to have out of the way ahead of time. 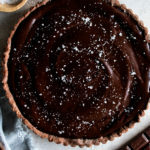 The rest of the tart is just a matter of making and filling each layer, each of which being made with just a few simple ingredients. Once filled, the tart gets chilled for an hour and is ready to go! You can make the whole thing a day or two in advance as well, if you’d like. I hope you get to try this for Easter, and definitely let me know if you have any questions on the recipe at all so I can walk you through it! Sift together the flour and cocoa powder. Set aside. In a stand mixer fitted with a paddle attachment, cream the butter and sugar for about 5 minutes until light and fluffy. Add the egg and continue to mix until incorporated, scraping down the sides of the bowl as needed. Mix in the vanilla. Add the dry ingredients all at once and mix on low speed until just incorporated (you don’t want to overmix this). Turn the dough out onto a clean surface. Use your hands to press it together into a disk. Wrap the dough in plastic wrap and chill for 1 hour. Preheat the oven to 350°F. Remove the dough from the fridge. Let sit for 5 minutes. Use a rolling pin to roll the dough out into a large circle, about 1/8” thick. Gently lift the dough and press it into a 9” tart pan, ensuring the dough fills all the edges and comes up the sides (you should have some dough hanging over). Use a rolling pin to press the excess dough off the top edge of the tart pan. NOTE: The dough will be crumbly during this process; just keep using your hands to press and work it together as you roll and lift. Once the dough is in the pan, continue to press it together to fill any holes. Once you have the tart pan evenly filled, top the dough with a large piece of parchment paper. Fill the entire tart with pie weights (dried beans work as well). Bake for 15 minutes. Remove the pie weights and parchment paper. Continue to bake for another 5 minutes, or until cooked through and slightly crisp. Let the crust cool completely. Add the sugar to a heavy-bottom saucepan over medium-low heat. Allow the sugar to melt. Once melted, continue to cook until the sugar turns amber brown in color, about 5-6 minutes. Swirl the pan often so that the sugar stays evenly dispersed. Turn off the heat and whisk in the heated heavy cream. Once incorporated, whisk in the butter, one piece at a time. Stir in the vanilla. Allow the caramel to cool for 5 minutes. Pour the caramel into the tart, using a rubber spatula to smooth it out into an even layer. Set aside. Next, combine the sugar, water, and a pinch of salt in a large skillet. Bring to a boil over high heat. Once boiling, cook the syrup for 30 more seconds. Stir in the coconut. Make sure all of the coconut is coated with syrup. Allow the mixture to cook just another minute or two until most of the liquid is absorbed. The mixture should be “wet”, but not drowning in liquid. Let cool slightly. Distribute the candied coconut across the caramel, pressing the coconut so it creates as much of an even layer as possible. Lastly, place the chocolate chips into a mixing bowl. Pour the heavy cream into a small saucepan and heat over medium-low until just simmering. Turn off the heat and pour the cream over the chocolate chips. Let the mixture sit for 5 minutes. Whisk until smooth and silky. Stir in the vanilla extract. Allow to cool slightly. Pour the ganache over the coconut, using a rubber spatula to smooth it into an even layer. 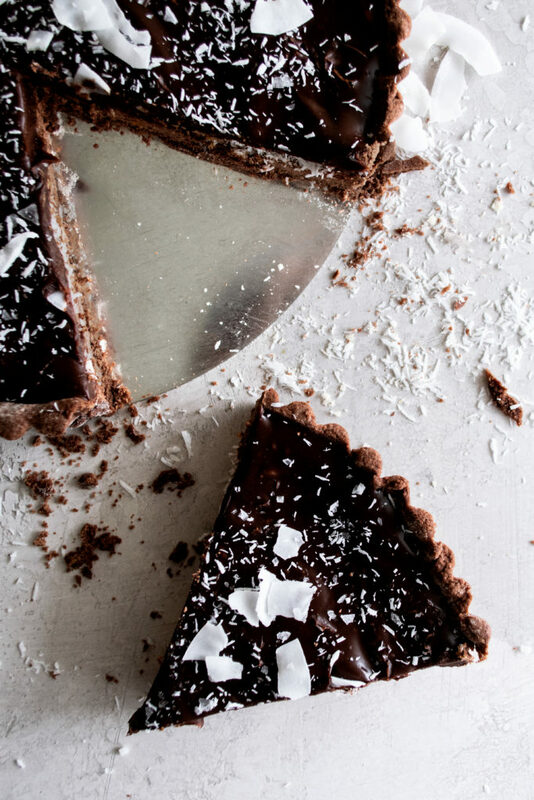 Top the chocolate with flaky sea salt and coconut flakes (optional). Chill the tart for 1 hour or until serving. Note: If chilling for a couple hours or longer, I like to pull the tart out about 20 minutes before serving. The dough can be made and stored in the fridge for up to 3 days. It will just need some additional time sitting at room temperature before rolling out. The entire crust can be baked and cooled the day before you make the tart. Just keep it in the tart pan, wrap tightly with plastic wrap, and store in the fridge. Or, the entire tart can be made a day or two in advance. Just pull the tart out further in advance (about 45 minutes) before serving to take the chill off.